Time seems to be my most precious ressource during this time of year. Actually I can browse my favourite online shops (in case I got time for that) whithout getting into fits about all the tea desires beyond my financial budget. Time restricts me in such a way, that I just know I can not sample any further purchases. But when Chris (Mr. Chenshi Chinatee) sends me samples, I warp the flow of time to create bubbles into which I can slip to taste those additions to his stock. A month ago, he sent me samples by that Grand Teaproducing Entity of bygone times: 6FTM or Six Famous Tea Mountains or Liu Da Chashan 六大茶山. According to Hobbes, Liu Da Chashan used to be better in times gone by: "Some of their older cakes, though, can be really very proper." 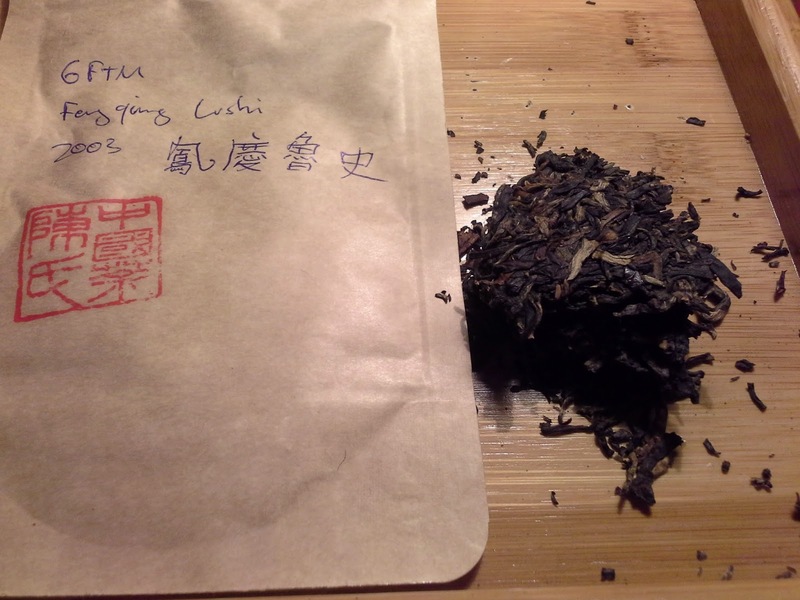 Well, the samples I received range from 2000 to 2003 - all being rather delightful with this Fengqing Lungshi being best among them all (according to my personal preferences). But what is this tea really like? Dry leaves are really dark brown with just a few golden tips. Seems the bing was pressed quite tightly as even now (almost 12 years later) I would still describe it as being medium compressed. Sniffing at the leaves in my preheated zisha pot, I detect [FLASHBACK - a wormhole in time takes me right back to my grand uncle's living room when I was a child no older than 11. My brother and I searching for the toy cars my grand uncle had hidden for us. Taking books from the shelves to see if anything is hidden behind them. Always being fooled by the box of cigar labels tucked away beneath the couch. Though I don't remember him smoking his cigars during our visits, everything is permeated by cigar smoke. A smell deeply connected to excitement and a most benevolent relative.] fond childhood memories. In the cup, the liquor looks less orange or reddish than I expect from a tea this old. In the mouth, I am amazed by the lack of sweetness. But this tea is far from lacking in other aspects! Its taste reminds me of Darjeeling First Flush mixed with my gand uncle's books. But honestly, who cares about taste in a tea like this! Though fragrance and and taste take me to ages long gone by, it is still full of energy that makes me feel young. My mouth feels vitalized, gums are pulsing, my mind is drifting through memories more than 33 years old yet fully awake. Actually the vitalizing effects can rival any Matcha I have ever tried. 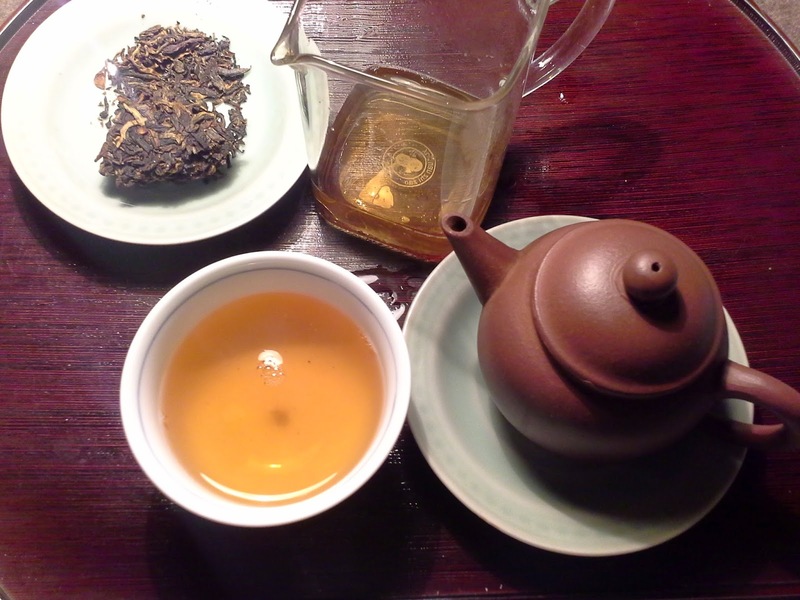 Reversing my time travel, I look into the future: 24 days left of this year ... and I can not imagine to find a tea which can take the crown away from this tea: surely this tea has given me the highest tea pleasures this year, being my personal "Number 1 Tea of 2014". While you are busy reading and listening, I'll just lean back and enjoy the next dozen infusions of this fabulous Fengqing Lushi. P.S. If you have already used up most of your tea budget, I suggest the 2002 Bangwai by 6FTM, being my second most favourite tea by that producer - at a lower price.